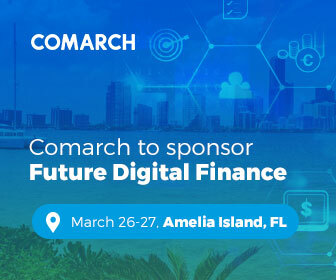 Future Digital Finance, which takes place on 26-27 March on Amelia Island, Florida, is the summit for 21st century digital finance leaders. We are happy to announce that Comarch participates in the event as a sponsor, speaker and exhibitor. Future Digital Finance is the conference that brings together digital finance innovators. Speakers represent the most innovative financial industry companies in the United States. Every year the event attracts both small FinTechs and large banks professionals. The theme of this year's edition focuses on innovation and transformation. What is more, some of the topics discussed at Future Digital Finance concern data, Artificial Intelligence and customer experience as well. The agenda is packed with more than 30 interactive learning sessions, workshops and presentations. World-class experts will present their most successful digital strategies, share experience with each other and discuss innovations that are most likely to transform the digital finance in the nearest future. Sylwia Hans – Financial Services Director at Comarch Inc., is one of the conference speakers. She has been working in the industry since 2009 and currently she specializes in both business banking and wealth management solutions dedicated to banking. Mark your calendars for March 26th, 10:50 AM and do not miss her presentation entitled “AI Assistants: In Phones Since 2011, In Homes Since 2015: Now Is The Time For AI In Banking”. The detailed agenda is available on the event website. Save the date and learn how Artificial Intelligence can support your customers. In addition, discover how automation influences cost reduction and opens up new business opportunities. Last but not least, learn about integration of new channels with the existing platforms. Get to know us better! We invite you to visit our stand. Comarch delegates – Sylwia Hans, Marcin Stefańczyk and Marcin Kołodziej will answer any questions you may have.